As the falsification of the Catastrophic Man-made Global Warming (CAGW) hoax become more and more evident, the Global Warming Nazis become shriller and shriller with their artful alarmism. The Collins English Dictionary defines statesman (ˈsteɪtsmən) as a political leader whose wisdom, integrity, etc, win great respect. Curiously the publication StatesmanJournal.com, with the publication of a letter below accompanied by a John Cole cartoon shows no wisdom, no integrity etc and certainly didn't win this blogs respect with the falsities contained in the letter and cartoon. I’m frustrated by the media’s misrepresentation of climate change. Ask the people in New Jersey and Louisiana who witnessed Hurricanes Sandy and Katrina firsthand. Ask the people in the town of Newtok, Alaska, why they’re moving their whole town away from the coast. Ask the people near Austin, Texas, about their wildfires. I defend others’ opinions to deny climate change, as well as to imply that we who do believe in climate change are wrong. However, in the interest of honest, open dialogue, criticizing us without offering/promoting/supporting/comparing your and our beliefs with clarifying evidence seems fruitless. Did you know that a bigger threat than carbon dioxide is the methane that will be released from a warming ocean? Earth Day is around the corner. We have as much right to use petitions to garner attention to our concerns as others do with their opinions. Remember, the consequences of doing nothing if we’re correct are far greater than if you are correct. Well, Roberta, I also am frustrated by the media's misrepresentation of climate change. I am also appalled by your misrepresentations of climate change. You use natural disasters as "evidence" that climate change is catastrophic. Most scientists, including the IPCC, agreed that natural disasters are NOT caused by climate change. You say: "I defend others’ opinions to deny climate change.." but Roberta, we don't deny climate change, we KNOW that climate has changed since time began. We also know that the late twentieth century warming has stopped and that there has been no global warming this century. Roberta, you must have had your eyes and ears closed and are not interested in learning the truth. 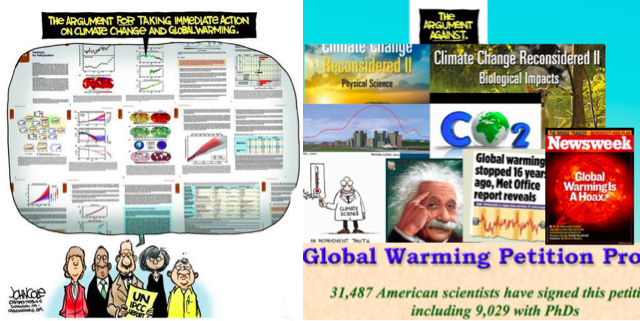 The NIPCC report: Climate Change Reconsidered II (pdf) offers more science than the IPCC's AR5 and has references to peer-reviewed papers. Unlike the IPCC's AR5, the CCR-II has no papers from advocacy groups. Moving on to John Cole's cheating cartoon. He tries to depict a weight of "evidence" against one man with snow on his roof. Even Mr Cole must KNOW that this is wrong! ONE ROOF - John? Make that most of the Northern Hemisphere, make it the Middle East....etc. See these news reports. 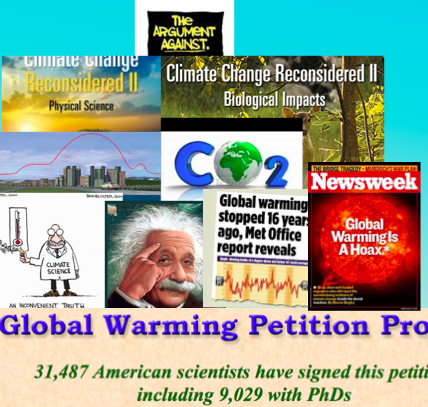 But there are the thousands of scientist who signed the petition project, there are thousands of papers that opposed the falsified global warming hoax (see also), there are the NIPCC's CCR-II reports. Mr Cole, your cartoon was unbalanced. Patrick Tobin is correct below that you need not be a scientist to "smell a rat." In fact, non-scientists are probably better at spotting the disingenuous, because we scientists traditionally trust the work of other scientists. But that is changing as we discover that our fellow scientists are subject to conflicts of interest problems as much as the average person. We have observed far too many instances where scientists are perfectly willing to go along with the prevailing paradigm, just because that's where the money is. As to "the evidence," both you and the accompanying cartoon are FAR WRONG. This is where it helps to be a scientist. I'm an astrophysicist with a background very similar to the Great Global Warming Guru James Hansen. 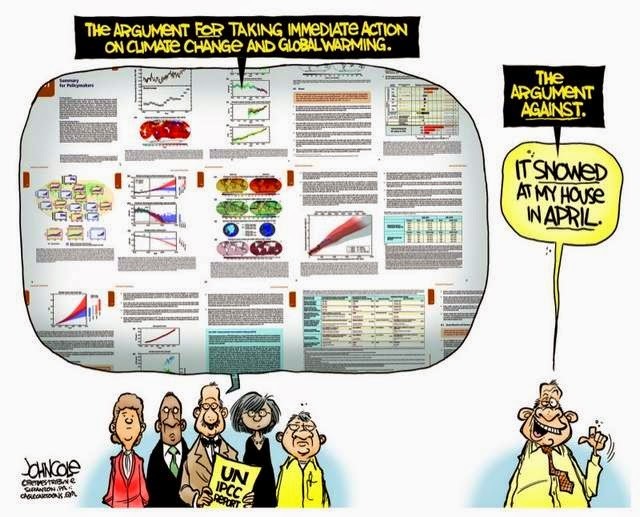 While there is a vast collection of circumstantial evidence purporting to link man's burning of fossil fuels to a catastrophic warming of the earth's climate, it is all best characterized as nonsense. You should be able to understand that hurricanes like Sandy and Katrina were not unusual events as hurricanes go. We know of many, many such storms in the past that caused vast destruction. They have actually been less prevalent in recent decades than in prior ones. We show that the government's case against carbon dioxide is easily found to be fatally flawed, by refuting the EPA's "Three Lines of Evidence." There has been no "unusual warming" since 1950. The EPA does not understand the physical basis of the slight warming that has occurred (mostly north of 20 N), because the 'Hot Spot' necessary in the tropical mid-troposphere is completely missing. And the climate models that are supposed to be sooo good have been unable to explain the lack of net warming since 1998 and are erroneous by a factor of as much as 3.5 in the temperature trend. We do as all scientists are supposed to do. We check theories against the most robust data we have, in this case high quality satellite measurements (available since 1979) and radiosonde measurements in the tropics. Lastly, you assert that we should go along with clearly falsified science, because you believe that the consequences are far greater if we continue to insist that science be objective. The real consequences that you should consider are those that result from blindly following false science that is really just politics and religion.